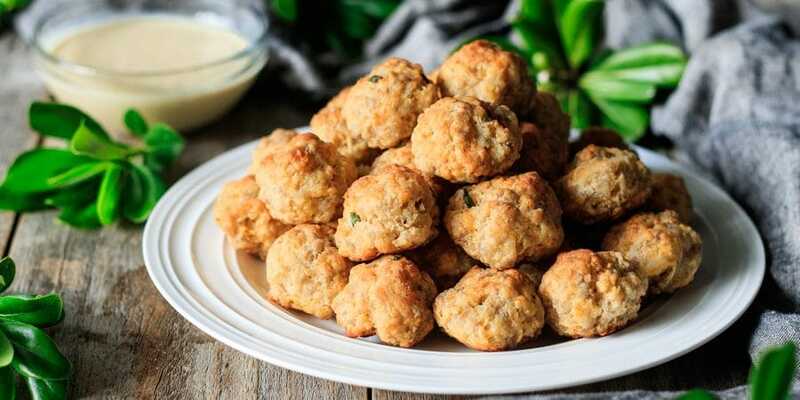 Easy cheesy sausage balls for a crowd is a simple make ahead recipe to serve at your next party. 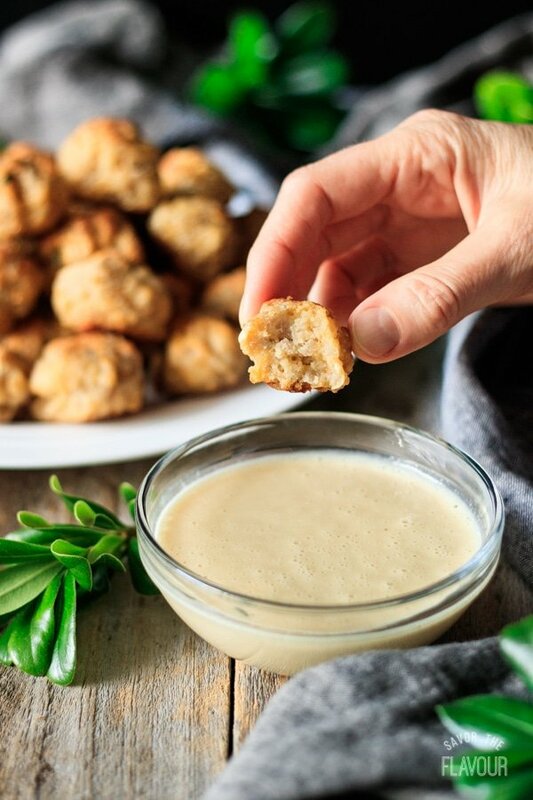 This addicting finger food is made with Bisquick, ground sausage, cheese, and spices. Bake until golden brown on the outside and moist and tender on the inside. 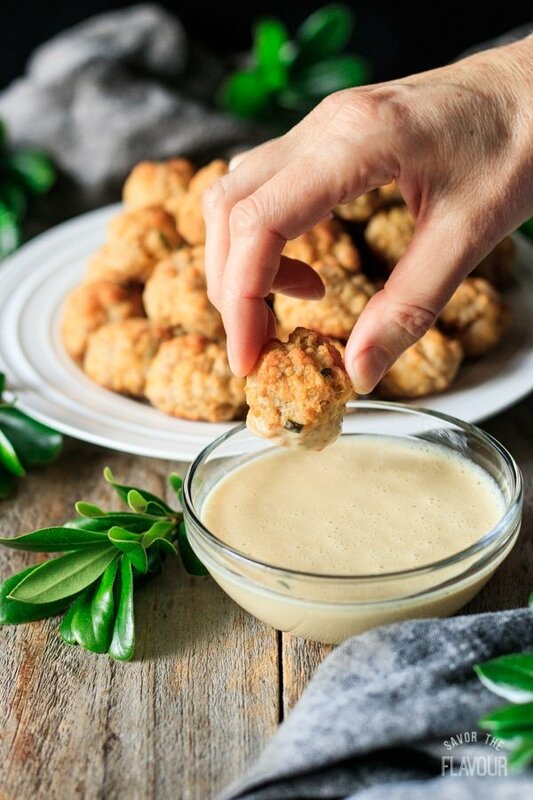 These homemade appetizers are always a hit for holiday parties, casual game days, tailgating, and brunch. Serve with dip and watch them disappear! 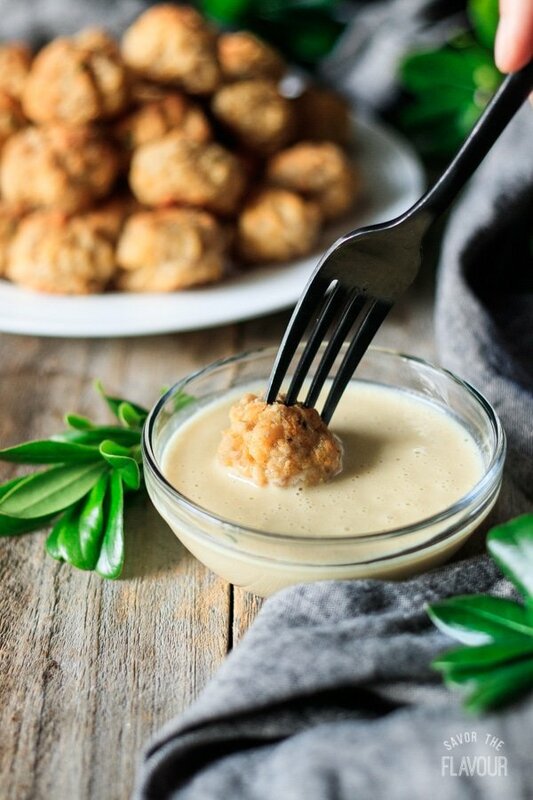 Looking for a savory appetizer that is guaranteed to please both young and old? 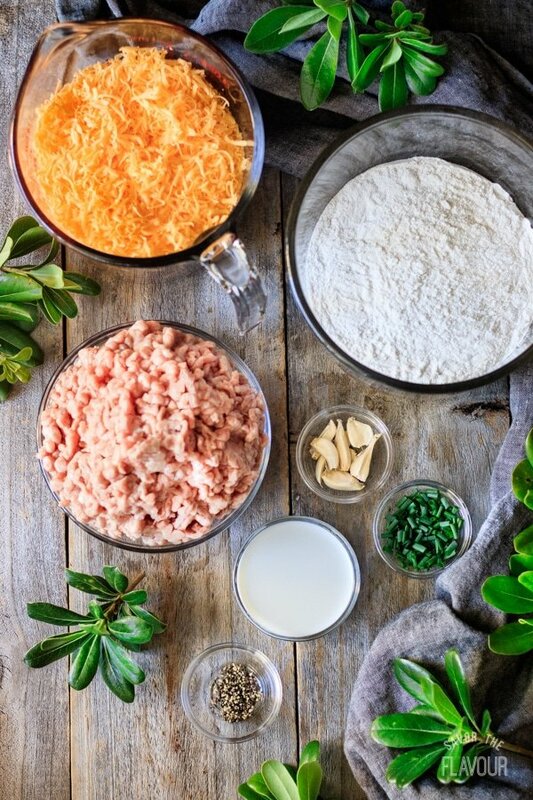 Try this recipe for easy cheesy sausage balls. They are crispy and cheesy on the outside, and tender and moist on the inside. Serve them up with a variety of tasty dipping sauces and you’ll have a room full of happy guests. Yes, keep the trays of the uncooked sausage balls in the fridge overnight, or freeze them on the trays for 1 to 2 hours then put in a freezer bag. They will keep for up to 6 months. When ready to use, just follow the reheating instructions below. How long should I cook the sausage balls? Fresh: 20 minutes at 400 F.
From Fridge: 25 minutes at 400 F. Sit out at room temperature while oven preheats. Frozen: 30 minutes at 400F. An inserted meat thermometer should read 165F. What’s a substitute for Bisquick? Here’s a recipe you can use to make a batch of homemade Bisquick, which is a popular American biscuit mix. What kind of sausage can I use? Since this recipe doesn’t have a lot of ingredients, try to use the best quality pork breakfast sausage you can find with 20% fat. If you have sausage with 15% fat, add in another source of fat (bacon drippings, lard, butter), or your sausage balls will be too dry. It is recommended to use pork sausage meat that isn’t in links, but if that is what you have on hand, just remove it from the casing. 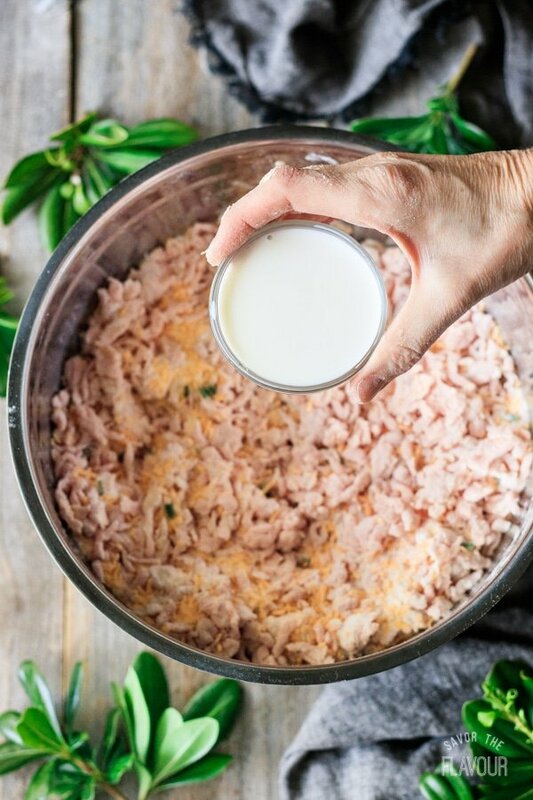 If pork isn’t on your diet, substitute with ground chicken or turkey. Can I change up the cheese? Of course you may! If you want, add 8 ounces softened cream cheese and reduce the cheddar to 1 cup. If you try this, it’s recommended that you chill the sausage balls for 10 to 15 minutes so they hold their shape while baking. Other cheeses you may want to mix and match are Parmesan, mozzarella, Gruyère, or pepper jack. I’ll let you in a little secret: for moist and tender sausage balls, use freshly grated cheese. Pre-shredded cheese is coated with cellulose (very fine wood chips), which is a moisture blocking agent. What other variations can I make for sausage balls? What kind of dips taste best with sausage balls? Gather the ingredients. Mince up the garlic, chop up the chives, and grate the cheese. 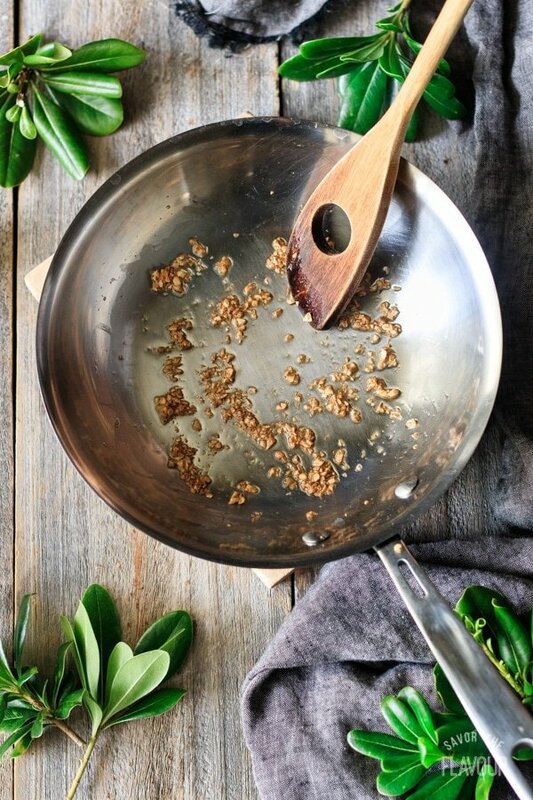 Saute the minced garlic in a little bit of olive oil until fragrant. Bake at 400 F for 20 minutes or until the internal temperature reads 165 F on a meat thermometer. When done, they should be a nice golden brown color. If you cut one in half, there should be no pink in the middle. Be careful not to overbake, or they will be too dry. Serve piled high on a plate, with toothpicks on a tray, or in a crockpot or chaffing dish if you want them to remain warm. Set out more than one kind of dipping sauce to please all your guests. If you’re making these for breakfast or brunch, pour a white gravy over top. Use freshly grated cheese. The pre-grated cheese will make the meatballs dry. Reduce the carbs by using less biscuit mix. Looking for other add ins? White onion, spring onion, fresh jalapenos, or habaneros. Want to try other spices? How about paprika, sage, rosemary, or Worcestershire sauce? Line the baking tray with foil or parchment paper for easy cleanup and lighter brown sausage bottoms. Use a small cookie scoop to shape the sausage balls. Too greasy? Drain sausage balls on paper towel. Make ahead and keep in fridge overnight or freeze for up to 6 months. If sausage is too lean, add bacon grease, lard, or melted butter to the mixture. If you’re in a hurry or have arthritis, use a stand mixer with a paddle attachment. Be careful not to overmix, though! Too dry? Serve a gravy over top and let them sit in the fridge overnight. Serve with more than one kind of dipping sauce for variety. For a party, keep the sausage balls warm by placing them in a crockpot on the warm setting. 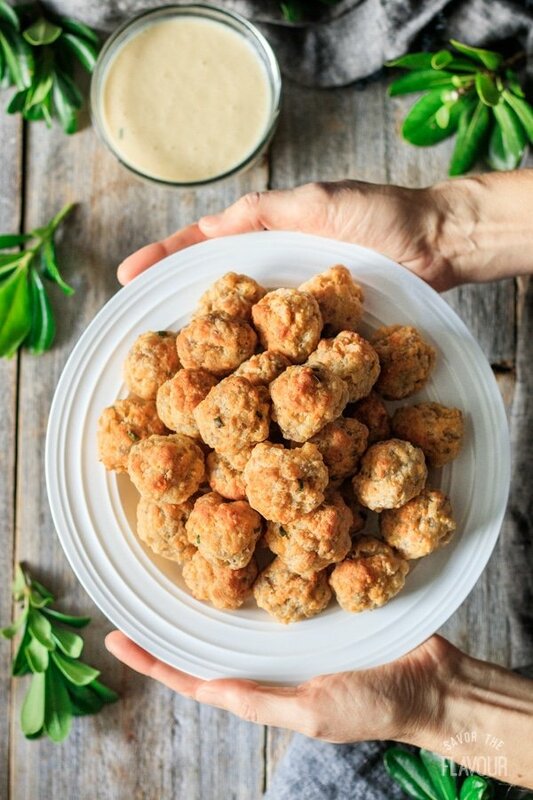 I encourage you to try these sausage balls for your next party or holiday gathering. They’re easy to make, and are guaranteed to disappear! Satisfy hungry appetites with these other delicious appetizers. 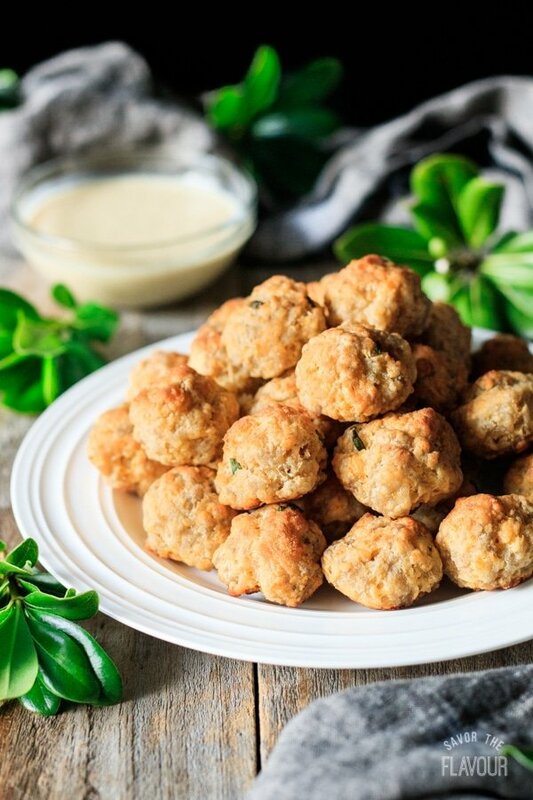 Polynesian Meatballs: these dainty morsels have a hint of crunch and a sweet-sour taste you’ll love. Easy Baked Jalapeño Poppers: you’ll be the VIP hostess with these creamy, cheesy, spicy peppers and sriracha mayo. 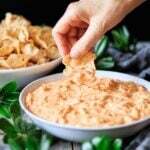 Buffalo Chicken Dip for a Crowd: kids and adults will love this cheesy 5-ingredient dip. Did you make these cheesy sausage balls? Please leave a star rating below the recipe to share how you enjoyed it! Heat the olive oil in a small saucepan set over medium heat. Add the minced garlic and cook for one minute or until fragrant, stirring constantly. Line two large cookie sheets with parchment paper and preheat the oven to 400 F. Meanwhile, roll the sausage mixture into 3/4 to 1 inch balls. Space them close together since they won’t spread, but not touching, so they can brown nicely. Recruit a kitchen helper to make the rolling go faster. Bake the sausage balls at 400 F on two different racks for 20 to 23 minutes, or until golden brown and the internal temperature reads 165 F. Switch trays halfway through baking for more even baking. Serve warm or at room temperature with a dipping sauce. 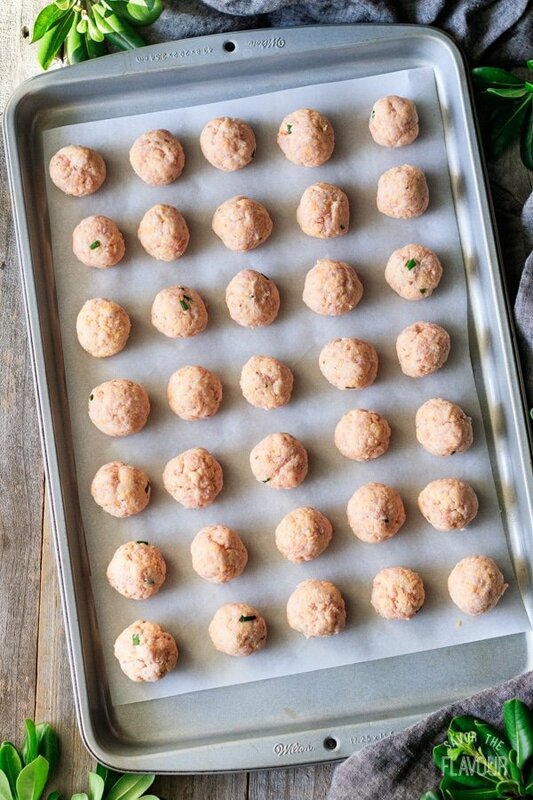 If you want to freeze one or both trays for future baking, place the uncooked sausage balls in the freezer for an hour or two, then place in a freezer bag.